There is a strong possibility of North Korea testing a miniaturized nuclear warhead in the near future, Defense Minister Han Min-koo told reporters Wednesday. 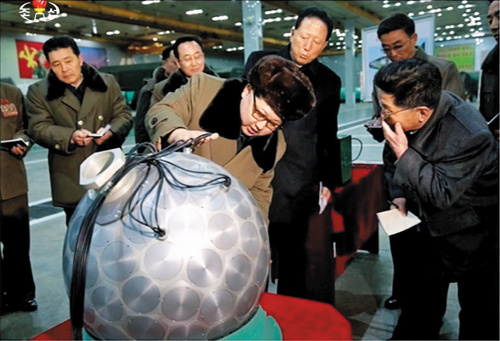 "North Korea can conduct a nuclear test any time," Han said. His ministry believes North Korean leader Kim Jong-un issued an order "soon." The military here believes North Korea has already completed preparations. Han said it could be detonated underground or without fissile material in the air. Han also said a new 300-mm multiple launch rocket system is likely to be deployed at the end of this year, which has a maximum range of 200 km. That would place South Korea's military headquarters within reach. North Korea is also developing a solid-fuel rocket which does not require a long period of fueling prior to launch, making it more difficult for the South's defense systems to react.